From invasions to rebellions, heroic martyrs to pragmatic politicians, industrial development to mass emigration, A History of Ireland in 250 Episodes by renowned Irish historian Jonathan Bardon will take you on a sweeping journey through Irish history, getting behind the historical headlines to reveal the lived experience of Irish people. Written in easy-to-read bitesize episodes, Bardon’s original and engaging style will make you feel as though you’re alongside William Smith O’Brien and his rebels at the Battle of Widow McCormack’s Cabbage Patch, traversing the country to banish snakes and convert Celts with St Patrick, and feasting with the Spanish Armada’s Captain Francisco de Cuellar and his wild Irish hosts. From taking up arms with the United Irishmen at Vinegar Hill to standing in solidarity with the workers of the Dublin 1913/1914 Lockout, A History of Ireland in 250 Episodes will take you right to the heart of Irish history. Featuring a cast of characters that leap off the page, from the well-known, like the hero of the War of Independence, Michael Collins, to the quirky, such as Susannah Cibber, the first soprano to sing Handel’s Messiah, A History of 250 Episodes will thrill, excite and inform you from start to finish. 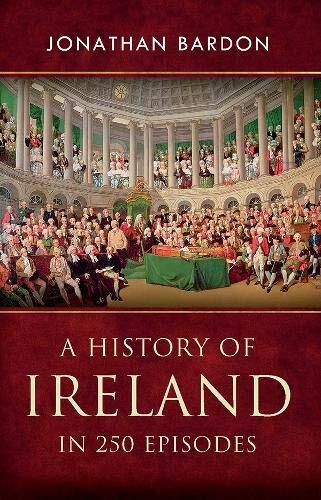 Whether you dip in and out of episodes or devour it from cover to cover, Bardon’s must-have book will teach you everything you’ve ever wanted to know about Irish history and much, much more beyond. Jonathan Bardon was born in Dublin in 1941 but has lived and worked in Belfast since 1963. He is author of several books on Irish history, most notably A history of Ulster (1992) and, most recently, A history of Ireland in 250 episodes (2008) based on BBC Radio Ulster broadcasts. He has written radio and television historical documentaries for BBC, UTV, RTÃ and Channel 4. He was chairman of the Northern Ireland Community Relations Council between 1996 and 2002 and was awarded the OBE for services to community life in 2003.